There are many people out there with big hopes and dreams, the realization of which seems impossible due to lack of starter funds. It sometimes seems hopeless and totally out of logic that so many great ideas and projects often never see the daylight because their creators never had the cash to encourage their dreams to come to life. Finding a sponsor for a project can be mission impossible sometimes, but even if you have reached the point of giving up on your ambitions, there still is hope, and a great deal of hope if I may add! Crowdfunding is the solution. The meaning of crowdfunding can be easily guessed from the name itself: it is a funding method, where the crowd funds one’s project, no matter if it’s personal or a business project, and they fund it with their own money. Who the crowd is? Well it’s common people who have the cash to invest in various ideas and projects. This does sound much like donating, but the main difference between these two is the fact crowdfunding is tied to the American JOBS act that basically allows online sales of small stock to a big bunch of invertors. Even though the act has not been passed just yet, you can still use the bliss of crowdfunding and use the method to enhance your project funds as long as it doesn’t involve selling any kind of stock. Some of the leading crowdfunding websites are: Kickstarter, Indiegogo, Rockethub, GoFundMe, Razoo, Crowdrise, PledgeMusic, Sellaband, Appbackr and Crowdfunder. As you can see, there are many different crowdfunding sites, and all of them have their own various methods of approach and purpose, but the concept of all of them remains the same: people post their projects to a wide range of site users who are potential investors, and if they find a project interesting and worthy, they will fund it with their own cash. The good thing is, the project creators need no prior investing, and all they need to do is post their project and wait. Crowdfunding sites charge only after their project has raised funds. You can do using some of the websites mentioned, or you can create your own crowdfunding website dedicated to your own project alone! 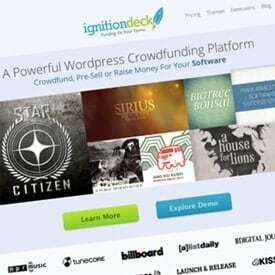 IgnitionDeck is a powerful WordPress crowdfunding platform. It was designed for makers, artists and entrepreneurs. You can use it with any theme and the IgnitionDeck skins will allow you to modify the framework so you can fit everything to your liking. IgnitionDeck is a command center for your fundraising campaign and the skins modify it in a way that puts all of the important statistics (goal, amount raised, number of pledges, etc.) in the spotlight. You will be able to enable any custom donation amount, and not lock yourself to the traditional level format. Funding can be fixed or flexible, meaning you will be able to take the money right away, or after you have reached your goal, the choice is yours. Real time statistics track supporters and payments through a beautiful, attractive front and backend. Implementing your stretch goals will be easy and done in a great manner thanks to the nice, functional IgnitionDeck Stretch Goals Extension. This plugin works with all of the most popular services, such as PayPal, Stripe, Braintree, MailChimp, Facebook, Twitter, Google+, Easy Digital Downloads, aWeber, LinkedIn, app.net, Pinterest and many more. Pricing of IgnitionDeck starts at $49. 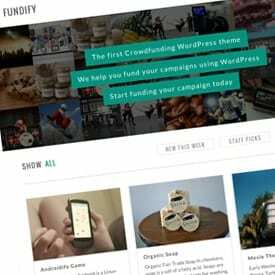 Fundify is a great responsive crowdfunding theme for WordPress that gives you a lot of customization and adaptation possibilities. It allows you to create an unlimited number of campaigns for anything you can imagine giving you full control to fund exactly what you want. You will be able to see the money amount rise the instant someone pledges money to a campaign, as it updates the total automatically. Backers can be tracked by site administrators on the backend, and campaigns will display them in the frontend. A custom Easy Digital Downloads extension has been integrated, allowing you to make any crowdfunding campaign the easiest way possible. The PayPal Adaptive Payment Gateway have been integrated also, and they will allow backers to preapprove their pledge amount, which means that if the campaign reaches their preset goal within a specified time, the full pledged amount gets charged, and the backers receive their reward. You will have full design control and you can easily adjust various elements, without worrying about your website looking funky because it features a responsive design which fits any screen size or resolution. The Fundify theme is priced at $99. 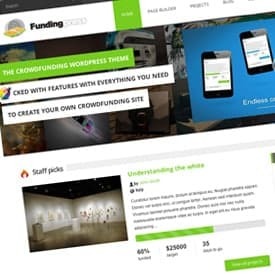 FundingPress is a compact WordPress theme that allows you to easily create your own attractive and functional crowdfunding website. The theme consists of many details that will help you monitor and follow the progress of your projects with ease, because it is all very easy to understand. FundingPress features a powerful custom admin panel that will allow you to create your own unique website that fits your needs perfectly. A page builder is featured also, so you can create pages within seconds with the easy drag & drop system. It comes with the PayPal Adaptive Payment Gateway integrated so you will have no worries about payments complications. Admins will be able to choose whether they want to collect the money or not once the campaign reaches its goal and they will be able to select if they want to collect the payment themselves or enable a user to do so. Once each donation is made the admin will see who made it by editing the project. The choice of colors is unlimited when it comes to the layout and it features a responsive design that adapts to any screen including mobiles. The FundingPress theme is non-GPL and priced at $59. CrowdPress is another responsive WordPress crowdfunding theme with a nice looking layout and a carefully chosen set of options. It will allow you to change the colors and fonts of the layout within seconds, and create yourself the unique website you desire. The campaign pages are big and bold and your website will look great everywhere, thanks to the fully responsive design. CrowdPress features a flipping homepage slider, and a page customizer which will help you easily change the layout, hide-able items and many more interesting options. This theme requires two FREE plugins to run properly: Easy Digital Downloads and Crowdfunding by Astoundify. The PayPal Adaptive Payments extension is highly recommended and it will work perfectly well with CrowdPress. The CrowdPress theme is priced at $99. 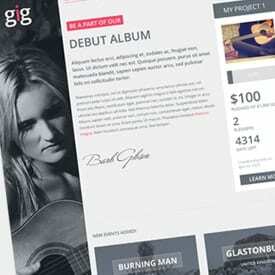 GIG is a premium WordPress crowdfunding theme created specifically for musicians and bands. It will let you display various pages for your music, band members, events, blog and crowdfunding for your projects with the support of the Ignition Deck premium plugin. The modern layout design will represent your band the best possible way, while giving you a lot of great options that will help you gain publicity. You will be able to connect with a bunch of social networks and promote your website through them. Announcing events, creating a gallery with great photos from gigs or carefully created dedicated music and band pages will ensure your visitors that you are serious about your project, and that your project is worth checking out and investing in. GIG comes with a total of 12 unique page templates included and 5 homepage styles you can choose from. It is completely responsive and it will look great even on mobile devices. The GIG theme is priced at $69 (click button below and check THEMES menu for demo). GoodWork is a fully responsive & retina ready multipurpose theme for WordPress. This theme features a modern, minimalistic design with a unique twist to it. Based on a four columns grid, it provides both modern and classic types of page templates. It is highly customizable and the complete look of the theme can be easily changed through theme customizer, which gives you a whole bunch of great options you can play with and enhance your website to the fullest. Changing colors, fonts and a lot of more options of your layout will be easy and done very quickly. GoodWork includes a slightly modified version of the great Visual Composer for WordPress plugin, and this will allow you to build your own pages just as you want to with ease. A lot of shortcodes available will provide many options for customizing your layout, and there are many different page variations premade which you can easily choose from using the shortcodes. This theme supports the IgnitionDeck crowdfunding plugin for WordPress, and even though it is not included in the theme purchase, it is highly recommended because it fits GoodWork Perfectly. The GoodWork theme is non-GPL and priced at $59. 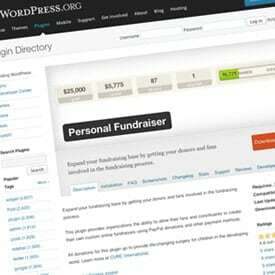 Fundraising is a powerful and flexible WordPress based system for crowdfunding websites. It is a plugin that gives you absolute control over your fundraising. The interface is totally problem free, creating your fundraiser will be as simple as posting to your WordPress blog. It integrates with PayPal and it allows you to create suggested donation levels, or you can let people choose their own. It includes recurring donations and it accepts payment in any of the major currencies. Various widgets are included allowing you to display a simple donation button, featured fundraisers and recent fundraisers in a widgetized area by your choice, anywhere on the website. You will be able to monitor your fundraising goals and donations with a progress bar included with the option of publically displaying them to your website. 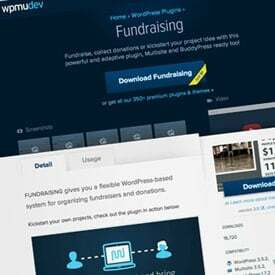 Fundraising works perfectly nice with Multisite and BuddyPress and you can use it with any WordPress theme you want to. The plugin is priced at $9. Apart from all of the great plugins and themes mentioned above, there are several very useful plugins needed for crowdfunding websites to work properly and successfully, and the best of all, one of them is FREE! Personal Fundraiser is a plugin that gives organizations the ability of allowing their constituents to create their own fundraisers using various payment methods. You will be able to expand your fundraising base by involving your donors and fans in the fundraising process. All donations from this great plugin will go directly to providing life changing surgeries for children in the developing world. If you want to do something good for those who eagerly wait for help, this plugin will allow you to explore the generosity of your donors and fans. You can download the Personal Fundraiser plugin for free by clicking the button below. Creating your own crowdfunding website is no longer complicated or hard work as it used to be. You will be able to make a great, functional website that is going to help you see your project financed with the help of these great themes and plugins. Have you come across some other “little helpers” that I haven’t mentioned? Please tell us about them in your comments, it will be greatly appreciated. I wonder what kickstarter have to say about some of the themes that are basically a complete clone of their design, less some of the functionality.